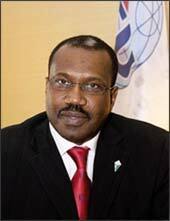 Dr Touré's contribution was rewarded with his reelection as Director of BDT at the Marrakech Plenipotentiary Conference (October 2002). His reelection gave him the unique opportunity to supervise the implementation of two action plans, i.e. Valletta and Istanbul Action Plans, and to spearhead the adoption of a third Action Plan by the Doha World Telecommunications Development Conference (WTDC-06). In his current position he has played a significant role in the World Summit on Information Society (WSIS) process by way of launching numerous projects based on partnership building with International Organizations, Governments, Civil Society and the Private Sector. Information and communication technologies (ICT) - essential for creating new skills and generating growth and technological change - are critical for Africa's overall economic development. ICT products are themselves part of the higher-value, high-tech products that are growing fastest in international trade and that can sustain faster growth of incomes. They are both enablers of competitiveness and a key sector in their own right. In this context, the International telecommunication Union has launched the Connect Africa initiative, with political leaders, CEOs and senior executives of global and African ICT companies, leaders from civil society and heads of international and regional development banks coming together in Kigali, Rwanda, to forge a Marshall Plan for ICT connectivity in Africa. The Connect Africa Summit was organized by the International Telecommunication Union, the African Union, the World Bank Group and the Global Alliance for ICT and Development, in partnership with the African Development Bank, the African Telecommunication Union, the UN Economic Commission for Africa, and the Global Digital Solidarity Fund. African operators are now forging ahead with deployment of next-generation technologies in the continent, including third-generation (3G) telephony, broadband Internet, and Voice over Internet Protocol (VoIP). Africa's greatest success story to date in telecommunications is the remarkable spread of mobile telephony. Africa's mobile market has been the fastest-growing of any region over the last five years, and has grown twice as fast as the global market. It has been a significant contributor to expanding access opportunities to a vast majority of its population. Mobile phones overtook fixed lines in 2001 and now outnumber fixed telephone lines by nearly seven to one, with 192.5 million mobile cellular subscribers in 2006. This ratio is even higher in sub-Saharan Africa, where 9 out of 10 inhabitants with access to a telephone are using mobile cellular telephone. Mobile penetration tripled from 6.3 per 100 inhabitants in 2003 to 21.0 per 100 inhabitants in 2006. This remarkable growth has been driven by the private sector and is greatest where the mobile market is competitive. Prepaid mobile cellular subscriptions have also been a major factor in mobile growth, with some 92 per cent of African subscribers using a prepaid package in 2005. Micro-financing, shared phones and microprepaid schemes with low-denomination top-up, balance transfers between subscribers have contributed to rapid growth. TradeNet in Ghana provides a simplified form of eBay over mobile phones for agricultural products across more than 10 countries in West Africa. Buyers and sellers post information about what they are after along with their contact details, which are then circulated to "matched" subscribers using Short Message Service (SMS) text-messages in several languages. Interested parties can then contact each other directly to do a deal. Similar projects are underway to provide daily price information for fruit and vegetable exports in Burkina Faso, Mali, and Senegal. It is also possible to develop ancillary services such as m-commerce, banking, financial services and Internet access. Such initiatives can improve the flow of business information and help reduce costs and boost profits. Worldwide, the total number of mobile cellular subscribers was 2.68 billion at the end of 2006; this is projected to surpass 3 billion by late 2007 and to reach 4 billion by 2010, with 80 per cent of new growth expected to come from lower income emerging markets. The future growth potential requires making mobile more affordable. The top 10 African markets account to almost four-fifths of all mobile cellular subscribers on the continent. One fifth of all mobile cellular subscribers live in South Africa, nearly a sixth in the large Nigerian market, while the four Maghreb countries (Algeria, Egypt, Morocco, and Tunisia) account for a further third of all African mobile subscribers. The rest of the African economies account for just over a third of all mobile cellular subscribers. Internet protocol (IP) networks form the basis not only of Internet access and browsing, but also of voice communications (including long-distance mobile voice traffic) as well as future video communications and entertainment. Upgrading to high-speed or broadband access will enable African enterprises to compete most effectively in the global market. Recent trends demonstrate that a number of international fibre projects are being deployed, both terrestrial and undersea, throughout the developing world by both incumbents and a whole range of other players. New undersea fibre-optic cable projects include the East African Submarine Cable System (EASSy) in Africa. Some countries are also trying to encourage multiple undersea cable projects. Both Egypt and Kenya have announced plans to attract competing undersea fibre-optic cable providers to further lower the costs of international Internet access, which is almost three times higher than the average for Asia. However, at least 10 African countries now offer broadband at below USD 15 per 100 kbps per month. In Senegal, the low price of broadband has encouraged Internet subscribers to migrate to Digital Subscriber Lines (DSL), with 25 per cent of all Internet subscribers accessing the Internet over DSL in 2006. Numerous terrestrial fibre-optic projects have also been launched. For example, the Trans- Kalahari fibre-optic project in Botswana is expected to be operational in 2008. This project is being implemented by the national incumbent, Botswana Telecommunications Corporation (BTC) and will deploy approximately 2000 km of optical fibre, connecting Botswana with Namibia and Zambia. The project is part of a wider initiative to liberalize Botswana's ICT sector, including the opening of its international gateway to competition and the introduction of VoIP services. In Africa, there were 17 national IXPs at the end of 2006. The Angolan IXP was the most recently established, the fourth IXP to be established in an African LDC with Rwanda, Tanzania and Zambia being the other three. The African Internet Service Provider Association (AfrISPA) plans to open IXPs in a further 11 African countries including Benin, Cameroon, Central African Republic, the Republic of the Congo, Côte d'Ivoire, Gambia, Malawi, Mali and Senegal. In addition to developing national fibre backbones and increasing international Internet capacity, establishing regional IXPs helps to keep regional traffic local, thereby reducing interconnection costs as well as latency. Governments, regulators and policy-makers can incorporate IXPs into their ICT development strategies as a way of using their international bandwidth economically. Due to the current lack of international connectivity, African countries are often dependent on overseas carriers that are based primarily in Asia, Europe, the Middle East and the United States for the exchange of traffic between African ISPs. Consequently, African Internet users pay a higher price for their connectivity. Opening the international gateway to competition can also reduce Internet costs as can the liberalization of VSAT markets. Such measures have been incorporated in recent competition framework announcements in Kenya and South Africa. National regulatory authorities can play a major role in improving connectivity by facilitating the establishment of IXPs in particular. The Federal Government of Nigeria actively supports the establishment of IXPs around the country, with the Nigerian Communications Commission (NCC) recently approving a proposal to fund the creation of IXPs on a not-for-profit basis in collaboration with the ISP industry under the umbrella of Internet Service Providers Association of Nigeria (ISPAN). With the overall migration to next-generation networks (NGN), flat-rate pricing is emerging as an innovative strategy to boost usage, increase the subscriber base, grow market share and offer greater affordability for customers. Celtel Nigeria, for example, has launched a pioneering tariff plan called Flat Unity Tariffs that eliminates price discrimination across networks by providing the same rates across all networks in the country, whether mobile or fixed. In general, low-income users have tended to prefer prepaid per-minute billing because they can more closely monitor their spending and use SMS to keep their ICT spends to a minimum. In order to drive increased Internet usage, however, operators in developing countries will have to develop affordable and attractive pricing packages that could include flat rate or bundled services. Bundling is considered by most incumbents as inevitable, given declining voice revenues and fierce competition from both vertically integrated operators and new players entering the market. In South Africa, the mobile cellular service provider Nashua Mobile, a new entrant in the broadband Internet market, began offering fixed and wireless bundles in March 2007. The company is evolving from a cellular service provider into a broader telecommunications player, using a targeted market strategy to attract subscribers through attractive bundled packages. Technological advances are transforming telecommunications markets and changing the nature of competition. The migration from circuit switched networks to Internet Protocol (IP)-based networks is opening opportunities for new entrants to offer new services and challenge established operators. Investment in ICT infrastructure in Africa was to the tune of USD 8 billion in 2005. Half of all Africa's fixed-line markets are now subject to competition and nearly half have private-sector participation in their ownership structure. 25 African incumbents have been wholly or partially privatized. In order to encourage the establishment of IXPs, it is also important to address policy constraints that limit cross-border connectivity between regional carriers. One of the biggest constraints is the need for operators to acquire licences for each country in which they expect to establish infrastructure. Market liberalization and regulatory reform must be matched by incentives to ensure the absorption of technology and development of local capabilities. Incentives are needed to build local capabilities and help make local firms become more competitive. These are best offered on a sectoral basis. Governments can promote competitiveness by designing a framework of incentives supporting higher-tech activities taking into account the needs of local firms, as well as large investors. Governments can also establish an enabling environment for investment in infrastructure. New technologies pose significant challenges for regulation and licensing that can be resolved only by governments working in partnership with the private sector. Action is needed to stimulate competition and introduce the affordable and high-quality services that are often lacking in markets where transmission capacity is abundant. The International Telecommunication Union's mission is to connect the world to the benefits of telecommunications and ICT, particularly those areas that are so far underserved. We are now focused on Africa as a first step in connecting other remote and underserved regions of the world. While Africa has shown great strides in mobile cellular subscriptions, Internet broadband connectivity is critical in ensuring that people in every corner of Africa will be empowered with information and knowledge to achieve their broader development goals. Some of the applications that have the potential to make the greatest impact on economic development are linked to broadband uptake. The high-speed broadband train comes fully loaded with benefits of the information society. Africa must quickly develop adequate broadband strategies to get online - on the cyberspace express!